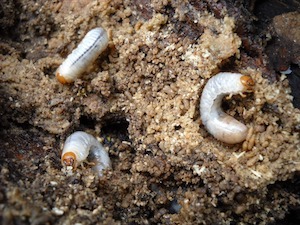 While grubs tend to appear during the late summer months, their effects are felt throughout every season. Recognized by their milky white coat, brownish head and “C” shape curl when disturbed, these unwanted pests can feed on the roots of grass until mid-fall and cause visible damage to lawns. And after a dormant cycle in the winter, mature grubs resurface to the upper soil levels and the feeding process starts all over again. When it comes to identifying these unwelcome guests, there are several easy-to-spot signs. This can come in the form of animals digging up your yard in search of grubs; dead patches of lawn that appear like loose carpet; and spongy areas on your lawn that feel like fresh sod. Or when pulling back a section of turf, you may come across a group of grubs. If you’ve noticed any of these signs or seen grubs in your yard, it’s time to take action. We’re here to help guide you through that process. Most of the grub control you’ll find today—including products available in stores—is pre-emergent. Most often used in the months of June or July, these preventative products are intended to guard against future generations of grubs versus getting rid of current populations. Removing existing grubs is a different matter. In this case, Dylox® is the recommended method of treatment. This selective, fast-acting insecticide kills grubs as well as other insects like mole crickets and sod webworms that can cause destruction to your lawn. The active ingredient in Dylox is trichlorfon. The ingredient acts as a contact poison that first knocks down select insects and then, once ingested, breaks down the functioning of their nervous system. This not only applies to surface-feeding grubs but also subsoil grubs, as Dylox can penetrate through layers of thatch that are ½-inch-thick. In terms of types, both granular and liquid formulations are available. The former involves the use of a lawn spreader, while the latter is simply a clear liquid that is mixed with water before application. In both cases, you should thoroughly saturate the area post-application. This activates the trichlorfon in granular formulations and enhances the results of the liquid formulations. Once you ensure complete pest control of your lawn, the next step is to tackle the damage grubs have caused. While there are different approaches to take, the goal remains the same: to revive the health and beauty of your outdoor space. One option is simply to remove the dead grass. Raking over the top layer of thatch can help loosen up any areas of brown grass without damaging the roots. When combined with deep watering once a week, new green grass will begin to grow and fill in these empty spaces. Another route to consider is reseeding. After removing damaged parts of the lawn, sprinkle seeds—five to seven per every square inch—across freshly loosened and fertilized soil. With regular watering, these seeds will begin to sprout and fill in the bare areas of your lawn. Sodding is also an option. The soil should be prepared in the same way as for seeding, but you’ll need to ensure the thickness of the sod will align with the existing lawn. This approach ultimately provides the most immediate solution, but it is also more costly and requires greater handling. Knowing how to prevent and solve grub problems is only half the battle. Homeowners also need to know what time of year they should take action. Fall is recognized as the best time to repair lawns from grub damage due to the season’s cooler temperatures. As grubs are sent deeper down into the soil for the winter, lawns can get the nutrients they need to wake up healthy and disease-free in the springtime. Looking for grub control that makes a difference in your lawn? The team at Weed Pro can help keep these pests at bay. Contact us to learn more.